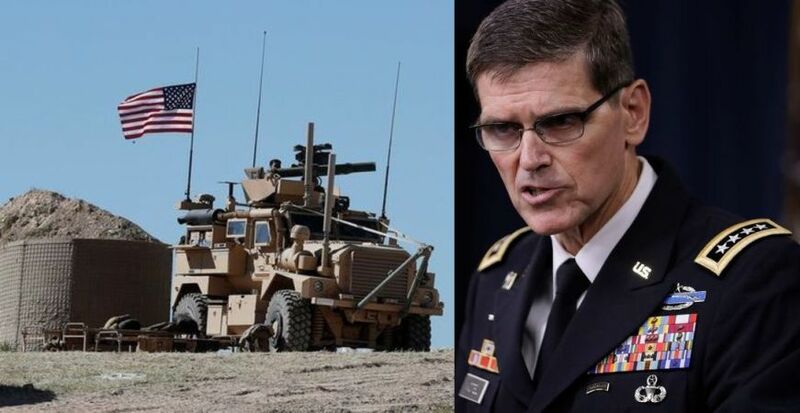 Gen. Joseph Votel, head of the US Central Command, failed to convince Israel’s leaders that President Donald Trump’s plan to withdraw US troops from Syria offered any advantages to their security, DEBKAfile’s military sources report. The visit in itself was a gesture as the first any head of CENTCOM, which is responsible for US military activities in the Middle East, had ever paid to Israel. The general was sent by President Trump to put before Israeli leaders the details of his plan to take US troops out of Syria in the coming months, except for a small contingent remaining to guard against Syria or its allies, Iran and Hizballah moving into the regions bordering on Israel and Jordan. Israel’s leaders did not buy the general’s presentation. They told him that the plan was far short of being able to stop Iran from building a military infrastructure in Syrian, a prospect that posed the greatest peril to the Jewish state. Details of the Trump troop withdrawal plan – and his secret iron in the Syrian fire – are revealed for the first time in the coming DEBKA Weekly out on Friday, April 27. Click here to subscribe. Israel has enough budget and hardware. The US presence is not going to be far off geographically in the region anyway. I don’t see an issue. Bibi is paying Kushner for results, not excuses. Votel better get in line or start looking for a new job. Not a chance. Centcom has never cared a lick about Israel. They are Arabist like the State Dept and don’t want to hear boo from Israel. This was a gesture and that is the end of it. Either Israel does it alone or with the Saudis but war with Iran in Syria & Hezbollah is coming quick. Russia is forcing Israel’s hand and there is no US firewall. Strange is it not how the Zionist State always attempts have others fight their wars and further its political goals. Its about time the US removed its troops from the regions and stopped further the Zionist Greater Israel project at the expense of the American national interest. As the Christian Bible says you reap what you sow and we have sown death and destruction in the Middle East for so many years. The current Zionist State is not based on the Torah and this arrogance and disobedience will be punished. Its sad how we never learn and that it requires a true calamity and that the correction will be brought about by the hand of the Ishmaelites! The sooner we stop the greater the chance that the horrors of the 5th Exile that Yekusiel Yehudah Halberstam, the Klausenberger Rabbe has warned of may be delayed. All of Israel’s wars have been fought by Israel. Israel never asked any other country to fight its wars. Concerning the righteousness of the State of Israel. You are correct. It is not completely based on Torah law but who is to blame. The fault lies with Jewish Diaspora religious leader who advised there constituencies not to make aliya. Had they made so they would have influenced the making of the state and made it much more Torah based. To stay away from Eretz Yisrael at this extraordinary and unprecedented time in our people’s history is a sin. There are religious leaders in the galus who repress the natural desire of observant Jews to return home, using the holy Torah to distort, deform and deliberately fabricate its divine intentions in the justification of that sin. This is intellectually and religiously heinous. To use the Mashiach as the opiate to suppress one’s inherent religious-national compulsions is traitorous to all the dreams, aspirations and prayers of millions of Jews over the last 2000 years. Their call rings out from all the basei knesset (synagogues) and batei midrash (studies halls) in the galut, “Wait for the Mashiach. He will be God’s messenger to bring us home. In the meantime, it is sinful to initiate any act designed for self- emancipation from the galus”. Those religious leaders in the galus live and propagate a lie while seeking to substantiate it through the truths of the Torah. We in Eretz Yisrael are experiencing an inverse situation. Most of our political leaders are living God’s truth but support and sustain it through secular Zionism. It was a mighty force brought to the world in order to create the political entity of Medinat Yisrael, but its thunder is gone. The values of today’s western democracy that are inculcated in our society espouse one vote for every person – Jew and Gentile, equality before the law for all, freedom not to believe in God, moral relativity and liberal sanction of all types of perversity. These are values unsuited for HaShem’s chosen nation. The religious, moral and historical basis of our claim to the Holy Land and our continued presence here are the Torah and HaShem’s promise that His Holy Land shall be the possession of His chosen people – the Jewish nation’s private fiefdom forever. But there are too many Israelis who have not experienced Torah study and have no inkling what they are doing here. Of our two societies, we in Eretz Yisrael are temporarily drunk with Western values; but tomorrow, we will be Jewishly sober. In contrast, many of the distorted thoughts and deeds of religious leaders in the galus are ugly and will remain so. We in Eretz Yisrael, even the most secular, speak the language of the Torah – Ivrit. The day to day language of choice of the Jews in chutz la’aretz – even by the most renowned rabbis and roshei yeshiva is the native language of the country in which they reside, the language of the goyim, with all its gentile associations that language brings with it. The holidays of the Torah are our national holidays for all. Those in the galut enjoy the serenity of Sunday, eat turkey on Thanksgiving, and are enthused by the “holiday spirit” of Christmas with its ubiquitous symbols of tree and holly. We walk on the land of princes and prophets; they tread on the tuma of “eretz ha’amim” – gentile lands. As time goes on, the adherents to the non-orthodox movements in the galus will vanish into oblivion. The Chareidi elements will not identify with any Jew who is not like them and at some point, will decide that they are the only authentic Jews in the world. They will metamorphosize into some strange minority that doesn’t fit anywhere. The modern orthodox will either come on aliya, merge with the Chareidi groups or inter-marry. At that point when there will no longer be galus Jews, and as the process of intermarriage between the Ashkenazi and Sephardi here will be dominant, we will once again become the one nation of Am Yisroel as we were when receiving the Torah at Mount Sinai. The Holy One, blessed be He, said to Israel: “You have made me a singular entity in the world, and I shall make you a singular entity in the world. –You have made me a singular entity in the world– as it is said: Hear, O Israel, the Lord our God, the Lord is one. –And I shall make you a singular entity in the world-, as it is said (divrei Ha’yamim- Chronicles 17,21): And who is like Thy people Israel, a nation one in the earth”. One nation under one God, with one land, one language, one Torah, one king, one Bet Hamikdash, one Sanhedrin, and one single purpose – to sanctify HaShem’s name in this world. The Torah states that the number of Jewish men between the ages of 20 and 60 who left Egypt totaled 600,000, in addition to countless women and children. The Yalkut Shimoni (Midrash interpretations and explanations on Torah) quotes one opinion that this number represents only 1 out of every 5 Jewish men, that is 3,000,000, meaning that 20% left and 80% remained. What happened to those who did not want to leave? The Yalkut says that they died and were buried during the plague of darkness. Imagine, in addition to having to prepare for the exodus and the korban Pesach and the mitzva of brit mila in the last week of our being in Egypt, our ancestors were busy burying their dead relatives! We and our children, and our children’s children are, the descendants of the irrational and fanatical extremists who put faith in HaShem before logic. Comparable to the Jews who came to Eretz Yisrael in modern times, some of whom established yeshivot while others drained out malarial swamps, but all of whom left the comforts of “home” in order to be irrational and begin returning to the land of our fathers. How useful for you to be able to start your daitribe by easily conflating G-ds holy people Israel with the Idolatrous state entity, so called ‘Israel’, when haShem Himself in His holy ToRaH would alternatively refer to Israel as Jacob and Jacob as Israel as the situation merited. Has the jewish state entity the merit of the name Israel? You claim the merit of prophets? Did He consult you? Who brings princes to nought, judges of the land He made like a thing of nought? Even [as though] they were not planted, even [as though] they were not sown, even [as though] their trunk was not rooted in the earth; and also He blew on them, and they dried up, and a tempest shall carry them away like straw. … hail shall sweep away the shelter of lies, and water shall flood the hidingplace. All the nations are as nought before Him; as things of nought and vanity are they regarded by Him. Yes, the Jewish state of Israel the merit of the name Israel? And a Jew in the galut is a chillul HaShem, but galut implanted in Eretz Yisrael is a perversion of Torah and an even more disastrous chillul HaShem. Yes, the Jewish state of Israel merits the name Israel? And a Jew in the galut is a chillul HaShem, but galut implanted in Eretz Yisrael is a perversion of Torah and an even more disastrous chillul HaShem. look who’s talking about a diatribe! Meir Itcha – your comments and perspectives are interesting. As a gentile, I speak from an uniformed position regarding aliyah and the diaspora, but I would agree wholeheartedly that Israel has been ill-served by its orthodox religious leadership. The Jews are in Israel again because God has ordained it to be so – contrary to their counsel. I realize that is a simplistic conclusion, but the diaspora is the lynch-pin prophetic event to make all of the others to come, possible. While I respect the position of Israel’s orthodox leadership, I believe they have been responsible for great suffering of the Jewish people throughout the centuries and have placed them in opposition to God, Himself. I respect your willingness to respectfully point that out. We, as Americans, love your people and pray for the peace of Jerusalem and all of Israel. Fake Jews are in charge of IsraeI, and have been for hundreds of years !!!!!!! Meir, dear ! Thanks for a fine, extensive post. It is wasted on “Baruch” – who most likely is a fake name for a clever blabber-mouth: one of many, who is paid to malign the Jewish state and its people ! BUT – Surely, many decent people: Jews and non-Jews alike enjoyed and benefited from your article. since when has israel induced anyone, other than her own sones to do the fighting and dying, to defend her people and her land? Yours was an absurd and blatantly ignorant statement. UAre you a troll, or a certified imbecile? Christian Bible? really? you mean a plagiarised Jewish Bible. Israel has fought ALL its wars WITHOUT help. Often re-supply of ammunition was even withheld. Inconvenient truth dispelling conspiracy theory, yet again. Torah shmorah…lot of good it did us in wwll. The Israelis seemed to have done quite well on their own in 1948, 1967 and 1973 without having had others fight the wars that were thrown at them. That being the case, you may want to review some of your own history, especially involving Europe after the first century including the multiple Crusades sent from Europe to the Middle East. You may also want to review World War II while you’re at it. Name one war fought on Israel’s behalf. The Russians are clearly taking israels issues serious otherwise they would have shown their disregard militarily… Putin is intrested to maintain peace for business sake so let them control the peace in Syria, Putin has already said he wont allow iran to attack israel. Are you telling us to trust Russia and their promise to protect us? Forget that. Russia want to to again become a leading world power, and the major player in the M E. Russia also has its eyes on Israel’s natural resources – natural gas and some oil. Israel’e export of natural gas to Europe threatens Russia’s monopoly. baruch you blame Israel for US support yet not mention Syria having Russian support.Your agenda? Abe, Baruch is either a typical galus Jew, a Jew for Jes-s, or even worse. The more visible Jews are in the galus – promoting their Jewishness, building larger and more magnificent religious structures and placing kosher labels on a plethora of previously-non-kosher products – the greater the desecration of the Holy Name, especially when the gates to the holy land are open to receive Rachel’s children. The Prophet attacks the presence of Jews in the galut as a desecration of HaShem’s Holy Name (a chillul HaShem), implying that our presence here in Eretz Yisrael is a sanctification of His Holy Name (kiddush HaShem). Russia has intervened to defend the Syrian people from the Zionist controlled ISIS terrorists who are intended to Balkanize the region in order to bring about the Zionist Greater Israel dream. My agenda is to wake up my few Jews to the horror that their continued support for non-Judaic, non-Torah entity that is the Zionist State of Israel. A question for the American Christians to consider is since the strong support for the non-biblical Zionist State of Israel has America enjoyed the blessing of God? Looking at the American decline from what it once was i think many would agree that if anything its far worse off. Its time that the world let the Zionists fight their own battles. Israel is nether moral nor supported in the Torah until the Messiah returns and gathers up his people. This will bring nothing but misery to the Middle East and the world. It time for the Western public to wake up and understand that Zionism is not Judaism. this is all made far worse when one considers that 95% of the “Jews” that you are supporting in Israel are nothing but Goyum pretending to be of Gods chosen people. The Anasazi Jews from Europe originate from the Khazarians which is about 2000KM to the north in the area of the Black Sea. This is sad and amazing at the same time when one considers that the true Semitic people are the Palestinians who’s land has been stolen and imprisoned in open air prisons by a the Khazarians who have never inhabited the Land of Israel. Its no wonder that the West which is always so eager to support the Zionist state is under a curse and under going a tremendous decline. Baruch, you last reply indicates that your are either a Chri-n or an Erev Rav. You belong to the 80% who never left Egypt. Baruch is a paid fake. See my response to your fine, lengthy post above. Baruch is either neturei karta or balestinian, although often it’s difficult to make a distinction. You, on the other hand, sound like a decent fellow, just unfortunately a bit confused. Understand this: what makes a true Jew is their connection to Hashem and His Torah. It certainly wasn’t national or demographic identity which accomplished that most improbable of miracles; the survival of the Jewish nation through the long and bitter darkness of galut Edom. We now stand on the precipice of full redemption, but the paradigm which sustained us to this point still remains the same. Please, I beg of you, don’t indulge in the sinat chinam of finger pointing at people who aren’t quite ready to jump into the dangerous morass of secular Zionist Israel – with all its attendant spiritual challenges – and who await, breathlessly eager – for the reestablishment of malchut Beit David in Eretz Yisroel. Until then, what remains most important is to maintain the spiritual connection that has preserved us for so long. If running pell-mell to live in Israel will jeopardize ones spiritual health – which I’ve personally witnessed happen to many families – better to do patiently and with bitachon what has gotten us here in the first place: wait, “achakeh lo bechol yom she’yavo” …. No worthless, with 10 like this one young lieutenant could get a full week free Yalta vacation for 2 plus a hand shake with congrats from Bortnikov himself! Judaism is about the people and so is atheism. Anything else is delusional mass hysteria and subject to false belief dividing the people. Israel will win its wars because of the humanitarian mission. Israel will win its wars because that is the will of the King and Creator of the world, HKB”H. And He will fight the wars for Israel as He has always done. it is possible that , “contractors”, will be inserted into Syria to replace withdrawn US troops. In galus, the goyim (Gentiles) the country and the Jews can reap the fruit by being good and loyal citizens. Plain and simply put: the Jews in the galus have failed the challenges that HaShem has placed before our generation. As the Jews in the galus draw ever closer to the ways and mores of the gentiles among whom they live, the Jews in Eretz Yisroel are drawing ever closer to historic, Halachic Judaism. Unless HaShem intervenes to change the apparent direction of history, the rift between us and the Jews in the galus will widen. In any case, as far as we might have to distance ourselves, one thing is certain, when the Jews in the galus will be in dire straits, Medinat Yisrael will be only a phone call away. Russia want Turkey out of the Nato. And then they will NOT RENEW the KARS PEACE.It must be renewed every 25 years.If its not renewed Turkey will loose 30% of its territory!Most of it will came back to Armenia! You have a point. BTW, when does the current Kars Peace expire? The treaty was signed in the city of Kars on 13 October 1921 and ratified in the Armenian capital Yerevan on 11 September 1922. If renewed every 25 years, a 100 years sets the next review for 2022. Interesting indeed. Many thanks to FSB and personal to President Putin for all scientific propaganda here, instructive material prepared from well before all with corrections and approvals required, this was an impressive effort indeed! But, why not publish in Russian? There is Pravada.ru too, why only on Debka? The americans also appeared at the end of the fair.Things have long been over.Sorry! Say, and how many of you are here in fact, or working in shifts? President Trump wants to show some progress to the American public. He’ll say, see we pooled troops out of Syria as we’ve defeated ISIS. But in fact he’ll have to bring more troops after to control Russians and iranians there. As for Israelis, they know how to act except it’ll be very stressful. Where do you suppose the list maker gets “rod” from? The KJV mistranslates it as “rod” in Proverbs 14:3, too. A rod is not alive — it is a “thing,” whereas a branch, shoot or twig are all part of a living plant or tree. Although Reuben Alkalay’s complete Hebrew/English dictionary gives “a rod” as a translation for חֺטֶר / ḤOter that translation makes no sense in context of Y’shayahu / Isaiah 11:1 which tells us that חֺטֶר / ḤOter is related to the masculine noun גֶּזַע / GEza. The exact wording in the passage is חטר מגזע / a major branch out of a trunk. The two go together — a major branch out of a trunk (not a rod out of a trunk which makes no sense). Let me explain. The word גֶּזַע / GEza is found three times in the T’nach. Y’shayahu / Isaiah 11:1 is the first, then Y’shayahu / Isaiah 40:24 (“Even [as though] they were not planted, even [as though] they were not sown, even [as though] their trunk was not rooted in the earth; and also He blew on them, and they dried up, and a tempest shall carry them away like straw.”) and the last instance is Iyov / Job 14:8 (“If its root ages in the earth, and in the dust its trunk dies”). A trunk of a living plant / tree. Thus “rod” makes no sense in context of Y’shayahu / Isaiah 11:1 — why do the KJV translators use a word which means an inanimate non-live thing (a rod) in analogy with a trunk of a living plant? Perhaps this is much ado over nothing — but it simply shows how translations (mistranslations) mislead and deceive readers. The translator made a choice, a wrong choice — and it makes no sense! So what does Y’shayahu / Isaiah 11:1 mean? What is it about? What this passage means is that the messiah (and this is a messianic prophecy) will be a descendant of King David, who was the son of Jesse. And this disqualifies Jesus from this prophecy. Which means he was NOT the son of Joseph, people just thought that he was. Per the Christian bible Jesus was not the son of Joseph, he was the biological son (supposedly) of the “holy spirit” — aka G-d. Thus Luke’s lineage of Joseph in chapter 3 is totally immaterial to Jesus. Was Jesus a branch, or a shoot for that matter? Jesus was not a legal descendant of King David, he was not eligible to be the messiah by his very birth — meaning he was not a branch (or shoot) of Jesse (David’s father). If Jesus were a virgin birth — if Joseph was not his biological father — he was not a descendant of Jesse because lineage is only passed paternally — from the father. Jesus was not eligible to be the messiah if he was a “virgin birth.” The messiah must be born of human Jewish parents. The father must not only be Jewish, he must be of the tribe of Judah and descended from Kings David and Solomon. The messiah will be a normal human. He will not be a demigod, The messiah will not possess supernatural qualities either, and performing miracles is not a criteria to be the messiah either. The Messiah (moshiach ben David — the messiah son of David) must be descended on his father’s side from King David (see B’reshit / Genesis 49:10, Y’shayahu / Isaiah 11:1, Y’rmiyahu / Jeremiah 23:5, 33:17; Yechezkel / Ezekiel 34:23-24). If the virgin birth story was true, and Joseph was not the biological father of Jesus then Jesus did not even have the most basic right to even try to be the messiah. The T’nach (Jewish bible) makes it clear that the messiah must be descended from King David and King David’s son Solomon. Some missionaries will claim that the “promise” that the throne must pass through Solomon is conditional, but this is untrue. Shmuel Beit / 2 Samuel 7:12-16 – When your days (King David) will be completed and you will lie with your forefathers, then I shall raise up your seed after you, that which will issue from your loins, and I shall establish his kingdom. (13) He shall build a Temple for My sake, and I shall make firm the throne of his kingdom forever. And then read Divrei Hayamim Alef / 1 Chronicles 22:9-10 – Behold a son will be born to you; he will be a man of peace, and I shall give him peace from all his enemies around about, for Solomon will be his name, and I shall give peace and quiet to Israel in his days. (10) He shall build a House in My Name, and he shall be to Me as a son, and I to him as a Father, and I shall prepare the throne of his kingdom forever. And while you’re at it read M’lachim Alef / 1 Kings 8:15-20; Divrei Hayamim Alef / 1 Chronicles 17:11-15, 22:9-10, and 28:3-7. Torah is clear that the messiah must be a physical offspring of both David and Solomon. The Torah specifies that blood rights, such as tribal lineage, are transmitted exclusively from a father to his biological sons. Whenever the Israelites were selected to serve in the army, it was done “according to the house of their father (Bamidbar / Numbers 1:17 – 18). “Who is a Jew” passes maternally (see D’varim / Deuteronomy 7:1–5, Vayikra / Leviticus 24:10, and Ezra 10:2–3) and lineage (tribal status) passes paternally (by the father — assuming one first has a Jewish mother) — and ALL of this is found in the written Torah. Sh’mot / Exodus 6:14, 6:25, B’midbar / Numbers 17:21, 34:14, 36:1, Y’hoshua / Joshua 14:1, 19:51, 21:1, 22:14, Ezra 1:5, 2:59, 2:68, 3:12, 4:2-3, 8:1, 10:16; N’ḥemyah / Nehemiah 7:61, 7:69-70, 8:13, 12:12, 12:22-23. According to the Torah, lineage/pedigree, a blood right, is passed exclusively by a biological father to his sons. Ergo the virgin birth totally disqualifies Jesus from being the messiah. Now return to Luke chapter 3. The T’nach tells us that the right to David’s throne passes only through his son Solomon — bypassing Solomon the author of Luke chooses David’s son Nathan — thus disqualifying Jesus from any claim to the throne even IF Joseph had been his biological father. Note the chart listing the differences in Matthew and Luke’s lineages which is found in UriYosef’s article Genealogical Scams and Flimflams. The list maker ignores Matthew in this claim, and Matthew gives a completely different lineage for Joseph. To explain away the two conflicting lineages for Joseph (who is not even Jesus’ biological father) some missionaries will claim that Luke is actually giving Mary’s lineage. “Mary” (if she even existed) was Jewish, her tribal affiliation is completely irrelevant as her offspring’s tribal status would have been that of the biological father. A woman does not pass tribal status, and her status changes to that of her husband’s tribe upon marriage. Bottom line: there are prophecies that the messiah will be from David’s sperm (seed), through his son Solomon. G-d further promises that David’s right to the throne is eternal (even though there has been no Davidic king since Zedekiah, the last Davdic king, reigned 2600 years ago (600 years before Jesus’ supposed birth). ​The claim that Jesus was the seed of David is false. Jesus was not the “seed” of David. Jesus was never a Jewish king (messiah). He never reigned. His line did not live after him — and the throne has set empty for 600 years before Jesus and 2000 years after him. . . The real messiah will be a Davidic heir — from David’s sperm through a Jewish mother and a Jewish father of the tribe of Judah, descendant of both Kings David and Solomon (adoption does not “work” — another missionary excuse). The real messiah will restore David’s throne — fulfilling the actual messianic prophecies that the messiah will indeed be both a Davidic king and that the right to the Jewish throne is eternally with David’s heirs through Solomon. It simply has not happened yet, thus Jesus did not fulfill the prophecies. Verbose but errant unbelief. He came and wasn’t the Conqueror you wanted Him to be (in that dispensation), and you couldn’t see His mission (at that time) was to save you from yourselves – not from the Romans. No impostor would have the lasting impact He has had on the world nor stand the test of time like He has. He is God – and many of your own people are coming to saving knowledge of that truth every day. And BTW, He is coming back as a Conqueror – and you’ll see Him coming in the clouds. He won’t be a Nazarene, then – He’ll be the King of Kings and Lord of Lords and the armies of heaven will be with Him. Your Messiah is coming, but He’s coming back to finish the work He started. Very good sergeant Galina Ivanovna, very good! It was a very complicate cut & paste, but it went well. This site is full of russian trolls (clowns) like iVaN_RaSPuTiN aka Ivan, aka Bruch, aka Solomeo and so on. Just like in the 7th season of Homeland. Don’t be stupid. The Redeemer aka next of kin had to be close relative to Adam. Read Vayikra or Leviticus to find the qualifications of the next of kin Redeemer. Adam had no earthly parents so his next of kin had to be the Creator Himself. So He is the seed of the woman and the seed of David. “Not for Jews” – Wow: what a flood of verbal diarrhea – enough to fill several crocks of s^*t ! is that you Lotte Lenya? Tel Aviv, Haifa, Damascus, Tehran, probably Moscow, and possibly New York and others, ALL GONE. If USA wants to contain Russia in Syria, it should leave Afghanistan for the Russians to worry about (drugs and insurgencies). Is DEBKA a religious website! JESUS JESUS JESUS MESSIAH MESSIAH MESSIAH KING OF KINGS LORD OF LORDS THE ANOINTED ONE THE FAITHFUL ONE THE HOLY ONE HE WILL COME AGAIN TO JUDGE BOTH THE LIVING AND THE DEAD AND ALL THE LIARS!!! Bibi should just call Kushner and tell him that if Downlow Donnie doesn’t fire Votel, he will not get any loans. Worked with Tillerson, didn’t it?